Tom talks about his experiences with fasting and how he is using fasting to help his Atrial Fibrillation(Afib). If you want to know more about fasting or hear more about Tom's story, you can message him on FaceBook. Ingredients must be listed in order of quantity on the label. People only look at the top 3-4 ingredients. The food industry started using less sugar, so the consumer would think the produce was more healthy. However, they are using multiple sweeteners in order to achieve this and keep the taste the same. Many times the product is sweeter than it started out being. Food companies create documents that "appear" to be scientific studies. According to the USDA - Salmon alone can't be considered health food because it is too high in fat. Lets talk stress. We review John's thought on how you can look at your stress level, trigger thoughts on how to know you're out of balance, and some ways you can tackle it. How do I find show notes? What type of alcohol is acceptable in keto? Is there a benefit to MCT oil over pills/powders? How often should I measure my ketones and blood glucose? Do you think collegan supplement is a good thing? Will it help with "loose" skin after weight loss? Is there a book you would recommend for someone just starting out? If I have cheated...what is the best way to get back into ketosis? How long does it take to get back into ketosis if I "jumped" out? What type of cardio do you recommend? What are some of the kitchen gagets you use? 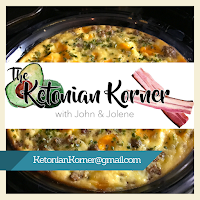 Can all recipes be ketofied?